Ribble Rousers A Cappella choir has begun! We are seeking more voices because we have to live up to our name – so come on down and sing your heart out! We are in the Drama Studio at Lostock Hall Academy (sports entrance) on Todd Lane North, Lostock Hall, Preston PR5 5UR. We meet on Tuesday Monday evenings from 7pm – 8.30pm. Sessions cost £6 but there are discounts for block bookings. Your first session is free so you can decide if it is for you at no cost. There are no auditions and no sheet music. I teach mouth to ear and give out free CDs for more complex parts. 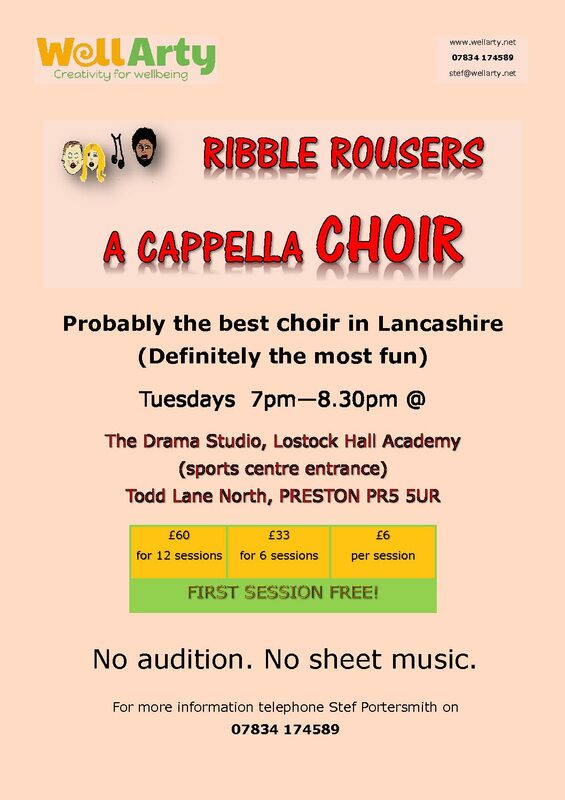 We are probably the best choir in Lancashire – definitely the most fun! • Singing is an aerobic activity that increases blood oxygenation and exercises the upper body. • Singing reduces stress levels and improves emotional well-being. • Singing with others combats loneliness and isolation and promotes community. • Singing and performing provide achievement opportunities, and achieving always feels good. • Singing in harmony sounds great!